Welcome to Striar Hebrew Academy of Sharon (SHAS), a coeducational, Modern Orthodox day school in Sharon, a beautiful town halfway between from Boston and Providence. 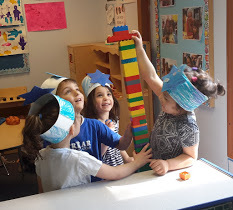 At Striar Hebrew Academy, we build community and better the future, one child at a time. We embrace Modern Orthodox Judaism as the wholehearted expression of Torah values and commitments through broad participation in the world. As a community of diverse individuals with shared values, our interpersonal, communal, and environmental relationships are governed by tzedek (justice) and chesed (loving-kindness). We offer an outstanding education in the joyous context of Torah and ahavat Yisrael (love of Israel), with equal emphasis on excellence in general and Judaic studies. Our teaching and learning engage the full range of our students' abilities, talents, and interests, providing them with the tools to explore and discover, as each child develops an integrated and confident sense of self.